Just imagine that you’re a trapeze artist, walking across a razor-thin high wire. The goal is to get from one end to the other without falling off. In taking steps while on the wire, the most dangerous time is balancing on one foot, as you walk forward, taking one foot in front of the other. Despite this, you’re able to walk an unbelievable distance, hundreds of time longer than anyone else. This happens to be the situation which occurs all the time inside each of your cells. There are some “molecular motors” inside of you, called kinesins, which walk in tiny steps along the cell’s high wires, yet do so with incredible fidelity. They are able to walk hundred of steps, orders of magnitude longer than other molecular motors. How can kinesin be so processive? The answer, according to a recent paper in PNAS, is because they spend only a small fraction of their time with one foot on the high-wire, when the chances of falling off are most acute. The method used was a single-molecule fluorescence technique. In general, single molecules are the most sensitive techniques going, and fluorescence is a technique exquisitely capable of seeing tiny amounts. A kinesin is labeled with two dye, one on each “neck.” The neck connects the cargo-binding domain to each foot. When the two dyes are in close proximity, they tend to be quenched, or not fluoresce. When they separate, they emit their regular hefty amount of fluorescence. 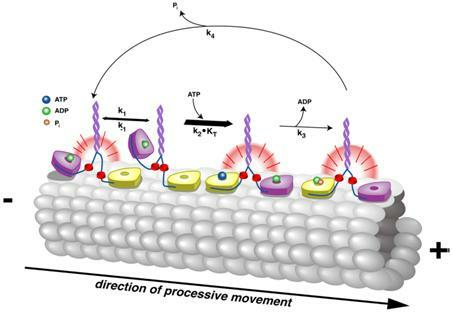 By looking at a kinesin walking along a microtubule—the cell’s “high wire”—they could see the fluorophores blink, turning off when the two dyes were together, and turning on when separated. In this way they could tell what fraction of time the two necks were separated, and what fraction of time they were together. The answer was 75% of the time, the fluorophores were bright, meaning that ¾ of the time the kinesin had both feet planted on the microtubule. What’s more, the authors managed to determine that even when the rear foot was in the air, the bound foot was in a configuration where it was unlikely to bind to a free ATP. Consequently, the kinesin was extremely unlikely to release both heads at the same time, a necessary prerequisite for it falling off the microtubule. Kinesin apparently is made to be a high-wire artist. Erdal Toprak, Ahmet Yildiz, Mindy Hoffman, Steven S. Rosenfeld, and Paul R. Selvin. "Why Kinesin Is So Processive", PNAS 106:12717-12722 (June 16, 2009).